With the usual spy shots and teasers done with, the new for 2019 Mercedes-Benz GLE-Class SUV has been revealed completely ahead of its official debut next month. The spy shots have given us a very good idea of how the new GLE-Class would look like and the official reveal also shows that the new car follows the design language seen on its latest offerings like the new A-Class and the new CLS-Class. This means that the design incorporates organic curves, rounded edges and a squat look. The front gets the new-shape angular headlamps and a prominent grille. The front bumpers also seem to have taken on a more aggressive look. The SUV gets a large glass area while the rear of the car is relatively simple but more cohesive now, with wide, angular tail lamps extending into the tailgate. The design of the C-pillar seen on previous generation cars is also carried over with a slight tweak to bring it up-to-date with the upcoming SUV's new design language. The new SUV has grown by 80mm in length and 20mm in width. Two powertrain options have been unveiled so far with more being expected closer to the car's launch. 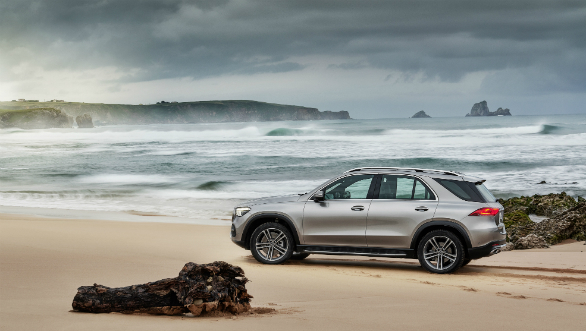 The first is the GLE 350 with a 2.0-litre turbo four-cylinder petrol which puts out 255PS and 370 Nm. The second engine option will come in the GLE 450 with its 3.0-litre inline six-cylinder petrol which will put out 367PS and 500Nm. A further 22PS and 250 Nm will be avaialble via the EQ Boost 48-volt integrated/starter system. All engines will be mated to Mercedes' nine-speed automatic. A plug-in hybrid version will be launched at a later date. The first AMG model will be the GLE 53 which will be powered by 3.0-litre twin-turbo motor. This 48-volt system allows the new GLE to have a new active air suspension system. This E-Active Body Control allows for spring and damping forces can be individually controlled at each wheel. This allows the car to counteract body roll as well as pitching and squat. Uniquely, the air suspension also comes with a free-driving mode. This is effective when the car is stuck in sand while off-roading. The system raises and lowers the car numerous time to increase traction, and then rocks itself free. 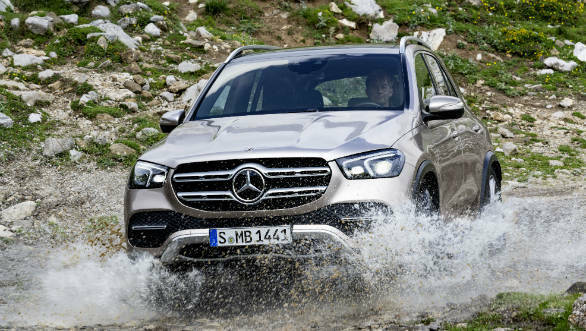 Speaking of off-roading, there is a new 4matic all-wheel-drive system that can now split the torque between the front and rear axles in any ratio from 0 to 100%, depending on the driving modes. An optional off-roading package gives the car a transfer case for the all0-wheel drive system. Other than this the entire suite of Mercedes' driver assistance and safety systems will also be available like active braking assistance, lane keep assistance, stop-go driving assistance and so on. A new system which recognises tailbacks and slows the car down in time will be available first here. 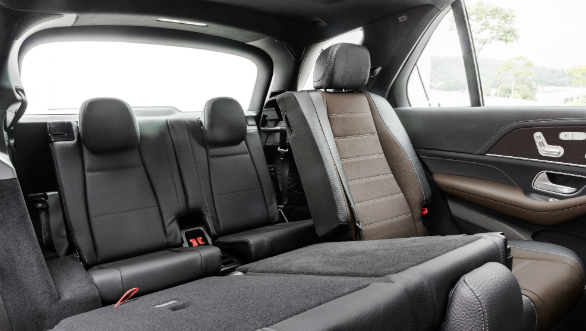 In the interior, the biggest news is that the GLE can now be optioned with third row seating. The length increase has all gone to improve cabin space. 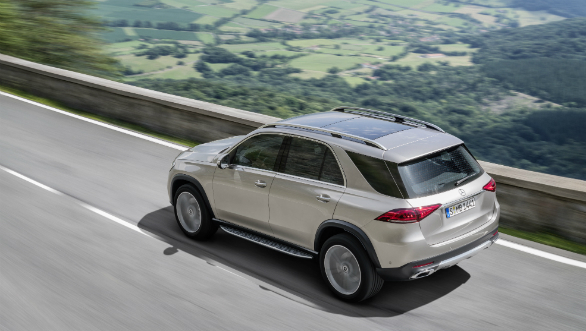 The overall design of the cabin is in line with those found in Mercedes-Benz's latest offerings like the new CLS-Class, but with certain cues to accentuate this SUV's more outdoorsy positioning. This is seen in the squared off air vents, grab-handles on the centre console and the high dash which rises up behind the large integrated MBUX system with its two 12.3-inch screens for both the instrument cluster and infotainment. A unique feature of MBUX is its AI-enabled learning capacity. The system learns from how the driver uses the system and soon starts putting out suggestions to remind the driver of tasks they usually complete at a certain time. Other than this, the usual qualities of Mercedes-Benz interiors like good fit-finish and design are present. 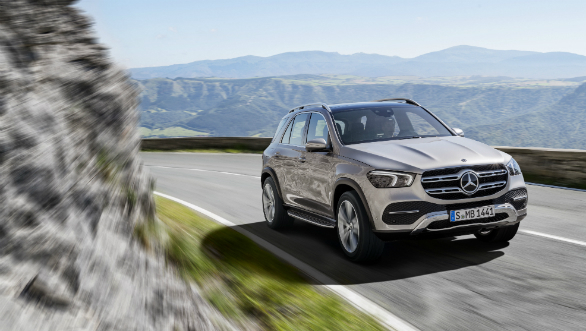 The new Mercedes-Benz GLE will make its debut at the Paris Motor Show starting from October 4. It will debut in the US in early 2019 followed by China in April. Expect the car to be available in India in around the same time. The GLE-Class in its present form has been around since 2012, first launching as the ML-Class. The SUV has been updated regularly but expectedly falls short of newer rivals like the BMW X5, Audi Q7 and Range Rover Sport. This new change which brings in Mercedes' latest tech and third row seating, seems to make the GLE a smarter, more rounded offering than before.